Is your website generating any returns for your business? Unfortunately, most businesses don't know if they are getting any leads or sales from their websites. For the businesses that are actually tracking these numbers, many of them don't know how to improve their website's sales performance. If you are new to conversion rate, you can read the detailed article regarding conversion rate on Nielsen Norman Group to learn more about the topic. So what is your current conversion rate? If you don't know your conversion rate yet, perhaps it's time to start tracking how your website is doing. If you are prepared for a new website for looking for ways to improve your current version rate then this article is for you. In fact, a properly implemented website project requires tons of time and resources on research, analysis, pre-planning which can be challenging for businesses that are on a tight budget. As we implement high conversion tactics on our own website and for our clients, we had to learn everything the hard way through trials and errors. If someone comes to you and tell you that they can help you to setup your business and that they can guarantee it will be an instant success on the first try, you would laugh at him/her. Why do you expect it to be different with website project? Most brands perform a major website overhaul every few years with little or no attention paid in the intervening time. They expect a perfect website can be done within the span of a few weeks or months, and they expect it to keep generating Returns on Investment for another few years without committing any resource to it until it's time for a new website. We are not you: we do not understand your business, your services, your products, your audience the way you do. You are not us: you do not have the experience we have working with the website. Frankly speaking, when we work with you surely compromises will have to be made and sometimes it's not for the best interest of improving conversion. You and Us are not the Customers: despite all the amount of work we put into research, analysis, and discussions; it's after all only our best guess of what may work in real life. There's just so much added overhead associated with starting and stopping a project. People need to get to know each other; we need to find time on everyone's calendar, spend weeks if not months on crafting website content, learn how to use the new website management system. There is just so much work that you usually end up rushing through it all with half-baked result. And just once you think you have been through it all, you will have to repeat this circle of hell a few years later when everyone involved tends to forget all the things that were done and why. In many cases, you will even switch your Website Agency for a new project, and so now you need to start everything from scratch. In most website projects, the team members involved are often forced to make LIFE TIME decision because once the project is done and signed off no other changes can be made. This leads to block, hesitancy, and affects the decision-making process of the whole team. Every single decision becomes a BIG decision and no one dares to experiment anything new. We have seen website projects that took over 6 months to finalize the contract and over a year to finish due to the time it takes to go back and forth between different levels of decision making. Outdated content: most businesses do not actively keep their websites updated, the usual cause is that they don't have the time to write new content and the skills and resources to polish and post it online. Outdated technologies: technologies come and go. Things that were popular in the past suddenly became obsolete. A good example is Flash technology which was used on many websites are now not supported on all major mobile browsers and not available by default on most modern desktop browsers. Most businesses do not update their website for years after launch and it comes at no surprise that they hardly generate any business from their websites. With Continuous Website Development, you will be are to build a strong team with constant communication and mutual understanding. Everyone knows how the other team members work, what to expect and how to handle interpersonal conflict. You are not forced to do it right for the first time but you will have the chances to track how it performs and continuously improve it over the time. Don't you think this will translate into a better product and higher Return on Investment? If you need a website just because, then any website agency will do. You can even do it yourself with website builders. If you are serious about online business, partner with an Agency that can grow with you. Traditional website approach simply does not work for most businesses. It's time for you to make a change. In this article, I will list the most useful tips and checklist items that I have learned with real pains and money for you to improve your website conversion. I intentionally pick only the most generic tips and items that can be applied to any business so that you can immediately take this information and implement it. 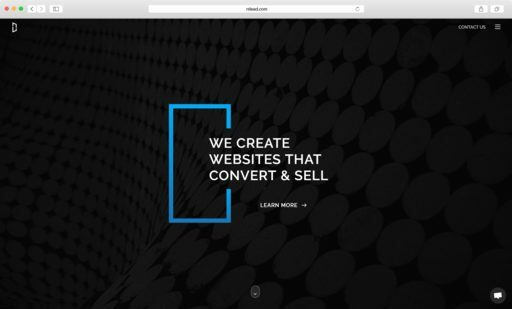 Before we dig into that list, however, let me share with you what I consider the single most important factor for successful, high conversion website. At least with website design, it doesn't translate. Beauty is subjective. It's a complete myth that beautiful website design will increase leads and sales generation. In fact, "ugly" websites may out perform their competitors which may look much more modern and "beautiful". Why? Designers: many agencies don't even have designers. They simply use ready-made templates and make adjustments to fit your requirements. If they do have designers, the designers mostly care about the aesthetic looks of the site. Programmers: they only care about the technologies they need to use, cool effects they have just found on the web and want to apply to your site right away. Sales & Account managers: ideally your account managers who manage your project should have enough knowledge to assist you in researching, analyzing and mapping out a plan for your digital strategy. Unfortunately, most website projects do not have any eligible account manager who should have the essential business and marketing knowledge. Form ever follows function. The appearance of your website should serve the purpose(s) of the site. If you are serious about your online success, you need to work with an experienced designer to craft your digital image. It doesn't matter if you use a website builder or contract an agency to build everything from scratch, you need to create a professional, trust worthy image that can promote your brand and your services. If it's really cool, people will talk about it and do free advertising for you. An example case is the Nike Better World website which was first introduced in 2011. Its brilliant usage of the Parallax Scrolling Effect has made it the talk of the year in Website design community and thousands of websites shared and talked about it. Nice designs can impress visitors, great designs can help you to present your business and services in favorable ways to your visitors. In this era when people make a decision to buy or contact you before they actually meet you, the first impression that you make will be online via your website and it is vital to your success. Once you have decided on the purpose(s) of your website, everything you do on the site (design, content, features, flow, ...) should serve that single purpose. Businesses often start their website project with an idea then eventually drift into purposelessness, and their sites have become Frankenstein monsters of patched-together tactics: a little bit here, a little bit there, a lot of unrelated content everywhere. The next time you want to put your Board of Directors on your website, ask yourself if that information is really useful to your visitors and can help you toward your goals. 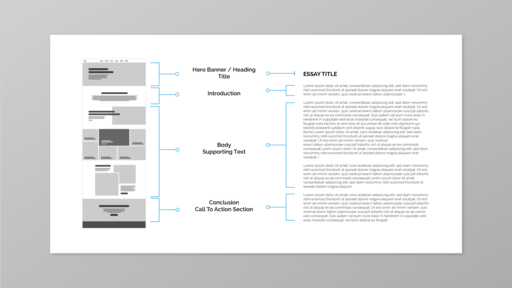 Sometimes I compare creating a website content to writing an essay. 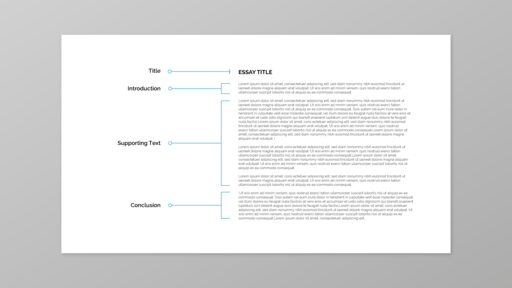 You start with an introduction and thesis statement (main idea of the essay), you will then need body paragraphs to offer support and examples for your thesis statement. Your essay will then end with a closing conclusion that should invoke further thoughts from the readers or call for certain actions. As you can see, the same structure can apply to your website. If your target is to generate leads for your business, you must first state what you do right away. Then you will need supporting elements to show why you are a better choice for your visitors (case study, testimonial, amazing product images, etc...). Once you have led your visitors through all the supporting elements you will want to present them with Call To Actions to encourage them to contact you or leave their contact information. It’s important to note that with a website your visitors can start from any page, not just the home page, so you need to come up with several flows for your site. I have covered flows in much more details in my article regarding the website design process guidelines, if you are new to how a website project should be, please check it out. This was the first thing you see on their homepage (they changed it now to something else since their service changes a bit). From the first look, you should not have any question regarding what they do and why you should use them. The message is clear, concise, and straight to the point. 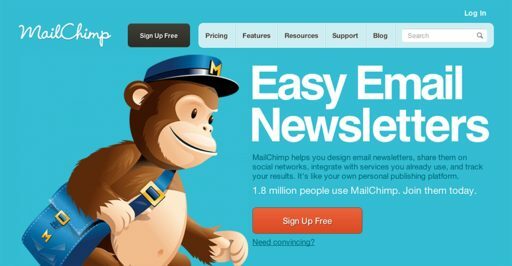 Mailchimp's target users are marketers who do not have much technical knowledge, so they don't try to be over technical about what they do. Making it easy is really important! Another example, of course, is our homepage: Our USP is that "We create high conversion websites". This message is put right in front of the visitors first coming to our site so they don't have to be confused about what we do. People don't like complex things. If your products & services happen to be very complex, then try your best to simplify them, put them in words that your target audience can understand and appreciate. It should come as no surprise that we apply lots of psychology principles in Website design. One of our favorites is the principles of grouping (or Gestalt laws of grouping) which basically says that says that we tend to order our experiences in a symmetrical, simple manner. We are afraid of complicated ideas and un-orderly design, and we embrace simple things that are less likely to give us any unpleasant surprise. You can apply this principle through out your design and your product/service offering. Lemondstand has a great article on this topic, check it out if you are interested in learning more about applying Gestalt laws in design. Try to remove distraction on your website, don't try to stuff everything on on single page. We human beings have a very limited processing power and we usually cannot handle multiple things at a time. Unfortunately, most businesses have so much to say about who they are and what they can do and they want to show the visitors every single detail at once. Remember that you should have only 1-2 goals on your website, anything that you presents on your page should takes the supporting role that leads visitors to perform the desired actions on your page. A website is normally a group of pages linked together. It’s important to be able to navigate to an important page within 3 clicks (page loads). Your visitors are generally impatient, you should respect their time and give them what they want (to find) in the shortest amount of time. Ideally, your website content and structure should seamlessly lead your visitors through each step of your defined users flow (see point 3 above) toward the goals. As of the time I'm writing this article, we ourselves are having an issue with our navigation system. How do we know we have an issue? We constantly monitor visitors' behaviors on our website and try to detect abnormal patterns that result in loss of leads and sales. As I have explained above, there is no way you can predict the exact customers' behaviors before you put your website into real-life use, the Continuous Website Improvement approach will help you to keep making your website better day by day. Initially, our side menu had many more links, so we had to use a vertical menu to fit everything inside it. We eventually removed most of the links because they confused the visitors (according to our research and experiment). Once we removed the links, we found another issue: according to the data we collected, we have doubt about the efficiency of this menu, it seems like many of our visitors do not notice this menu. The "Contact Us" next to the menu icon confused people. Some of our visitors do not notice that they can click on that to contact us, they think they need to click on the menu icon next to it instead. A number of visitors dislike the extra 1 click action to open the menu, we suspect that we can improve the click through rate on the menu if we display everything by default. So what do we do? We serve 2 different versions of the menus randomly to visitors and measure the impact on Click Through Rate to see which one works better for us. I will post an article on this experiment once we have more data to come to a solid conclusion. "Hick's law, or the Hick–Hyman Law, named after British and American psychologists William Edmund Hick and Ray Hyman, describes the time it takes for a person to make a decision as a result of the possible choices he or she has: increasing the number of choices will increase the decision time logarithmically." (Wikipedia). If you offer products and services on your website, try to make it very very simple for your users to make a decision. Businesses often make the basic mistake of offering too much which confuses the potential buyers and lead to hesitancy and blocks. Once you have simpler offers on your site, you don't have to rely on lengthy and complicated content to present your products and services to your potential buyers. Obviously, if your products and services really deserve a detailed explanation (and some buyers do prefer to know all the details before they decide to contact you), you can put the advanced, detailed explanation in a separated section that the users can decide to see more if they desire. The mouse pointer is supposed to change into a cursor when you hover over a clickable element. the website links are supposed to be underlined or decorated when you move your mouse pointer over them. dropdown menus are supposed to have a down arrow to tell users that they are dropdown menus. 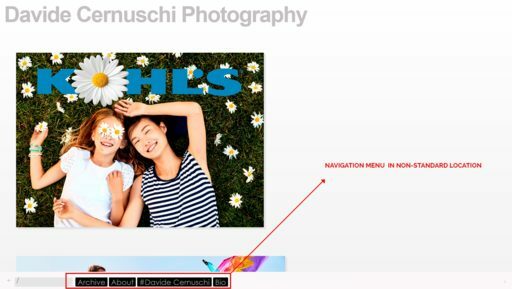 If you ignore these things, your users may misunderstand the intended purposes of the design elements on your site and may completely ignore them. It's tempted to break the norm to create unexpected behavior and capture users' attention. It's worth a try but does not over do it because you may turn your visitors away. As the rule of thumb, the younger audience tends to take this experimental approach more positively than the older generation who can be more easily irritated with unconventional behavior. 10 years ago, life was easier for us all. At least when we think about a website, we didn't have to think about tablets, phones, smart watches and thousands of variations of these devices. Nowadays, your visitors may access your website on multiple devices. In fact, a visitor can visit your site multiple times, on multiple devices before they actually make a decision. While many website agencies advocate for Responsive Website design, in my opinion, it’s neither mandatory nor enough. Depend on your target audience you may want to focus your effort on a single device or across different devices. The more devices you target, the more time and resources you will have to spend on design, development, and maintenance. Do not try to cover more than you have to, always check your visitors preference first. If you really have to serve audience on multiple devices, you need to consider the design styles and the technologies that you should use. For design, your website should display nicely on the devices you support and you may need to choose between Responsive design and Adaptive design. In short, if you need to give your users completely different experience on each device you should use Adaptive design, the otherwise Responsive design is cheaper and fewer resources consuming. Modern versions: at of the time this article is written, Internet Explorer 9 and below are usually not supported. Some agencies go as far as dropping support for Internet Explorer 10 as well. Major devices: iPhones, Android phones (with standard screen sizes), iPads, Android tablets (with standard screen sizes), desktops and laptops (with standard screen sizes and usually does not go above Full HD). If your business needs to target people with smart watches or those who use Blackberry, you need to clarify this with your agency. 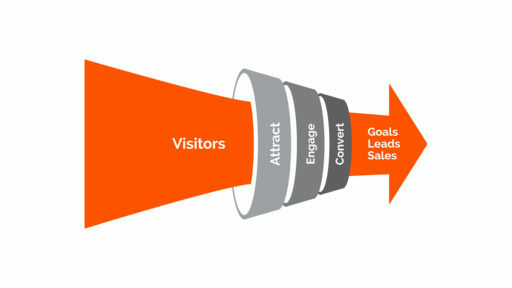 Ensure your target audience can access your website easily is essential to high conversion. The purpose of your website is to serve your visitors. The first thing you do should be researching your target audience, understand how they normally use the Internet in general and your website in specific (if that information is available). 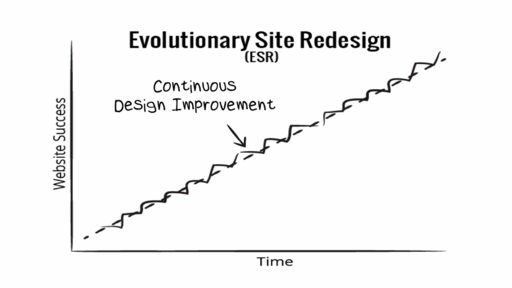 Responsive or Adaptive Design is just one of the things you have to worry about. You want to know which browsers they use to access your website, where they access your website, etc... If your target audience consist of a large number of corporate workers for example, they may tend to use Internet Explorer more than browsers such as Chrome or Firefox, so you need to ensure your website work well on Internet Explorer (and there are many versions of Internet Explorer too). If you have many customers visiting your site on mobile devices then using Flash is a big NO NO (actually it should be a big NO for desktop users as well). If you already have a website, you can use many FREE tools such as Google Analytics to track and view a summary of your visitors' information. If you do not have a website yet, then you can take your best guess from your users' analysis. A better method is to support the minimal list of users and devices then constantly monitor and update your website to adapt to real life data with Continuous Website Improvement approach. Get in touch today, we will show you how we can help you to grow your business online. No commitment required on your side. Your visitors will greatly appreciate you for providing useful content that can help them. If you are selling houses, you can share with them your experience on how to find the best house or how to detect a bad deal. Search engines love useful content. They constantly update their algorithms to fight against spammy content so you may trick Search Engines for a while but not for long. Great content, however, will stay forever and will help you rank top of the list. Once you have great content, ensure that your users can easily access and read them. Some websites use terrible combinations of colors and typography choices. Any competent designer should be able to help you to create a color palette that matches your brand image and works well for your website audience. Font family and font size choices are also extremely important as well, don't try to challenge the patience of your visitors. If you have lots of text content, or if your target audience is from the older generation you should consider using easy to read fonts with big font sizes. 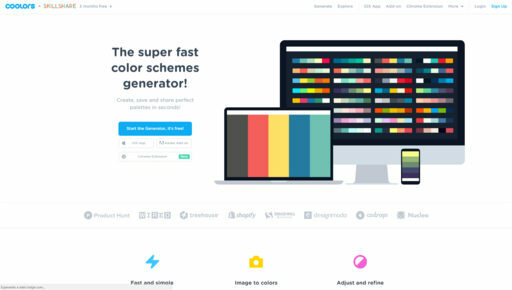 If you need help with generating your color scheme, try this FREE colors tool. We use it all the time and we love it. We have an article on using colors in website design on our blog, check it out. Picture speaks a thousand words. Many of us are wired to process pictures way better than text. That's the reason why you see so many pictures in this article, it would be extremely boring and hard to read otherwise. I don't understand why most businesses use low quality images. And that includes physical product retailers as well. If your website is for you to advertise your products, then why would you use tiny, pixelated pictures taken with your phone? Server space is cheap, internet is fast, most smartphones can take acceptable pictures. There is no reason to settle with low quality images. You can also use stock images as well, many website offer FREE stock images that you can use for any purpose. Please make sure to use stock images wisely however, otherwise it may bite you back since stock images can look fake and reduce trust. Whenever possible, prioritize real pictures of you, your business, your products over stock images. If you can show your phone number, contact information on your site, do it, it creates more trust. For our own site we had a huge issue with the amount of spams that we received we had to temporarily remove our phone number, it's partly due to the not so strict laws here in Vietnam. It's simple, people are impatient, they hate to wait. If your website takes too long to load they will just give up and go to another site. 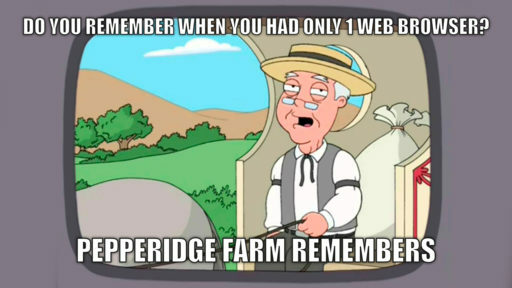 Websites that load faster also encourage users to discover more pages per visit. There are many many things you can do to improve your site's loading speed but the fastest option would be to optimize the images on your website. We covered website speed up in much more details so please check it out. To end this article, I would like to make this a separated point on its own because it deserves the attention. Sure it's your website and you can do whatever you want, but if you really want people to patronize your products and services you should treat them with respect. Think of the nuisance when your website, for example, automatically turns on music or videos in the background when the users visit your site.